Headquarters, 2nd Battalion, 11th Regiment. Condega, Nicaragua. 1 March 1928. From: First Lieutenant Edward F. O'Day,U.S.Marine Corps. To: The Battalion Commander, 2nd Battalion, 11th Regiment. On 27 February 1928, the ration train under my command that left ESTELI on 23 February, 1928, and proceeded to SAN RAFAEL and YALI with commissary stores, cleared YALI at 8:15 a.m. on 27 February, 1928, all stores having been delivered. The column consisted of one officer, thirty five Marines, one pharmacists mate third class, U.S.Navy, twenty muleros and two "Jefe" muleros with ninety nine mules and was proceeding along the trail between YALI and CONDEGA. At approximately one-half the distance between the two towns, the column was ambushed by the bandit forces. The exact location of the skirmish is about one thousand yards west of a town named BROMADEROS [El Bramadero]. 2. The column had just been closed up and was proceeding west, and as it entered the flat space of ground between the two ranges of hills, the Bandit Forces opened fire on the right flank of the column throughout its entire length, also from the front and rear of the column. 3. The firing commenced at approximately 1:30 p.m., and lasted until 8:30 p.m. the same date, when it subsided to irregular harrasing fire throughout the night. It is estimated beyond doubt that the bandit forces had a minimum of four machine guns, at least six hundred rifles and a large quantity of dynamite bombs. It is estimated that at least two hundred dynamite bombs were discharged. 4. The bandit forces withheld fire until the entire column was in front of them, varying in distance from 75 to 200 yards along the trail. The first shot of the skirmish was directed at the undersigned and was immediately followed by simultaneous firing along their entire line, the opening up with everything that they may have had. The mule train was stampeded upon the initial burst of fire along the line. The Marines eased off to the brush on their left and commenced firing. Being out-numbered to such an extent and the bandit forces having fire [ p. 2 ] superiority, the Marines eased to the left gradually, taking position on a ridge. The Bandit Forces continued incessant fire until about 2:30 p.m. when they advanced towards the Marines in line of skirmish. The machine guns keeping up fire on the Marine's positions, in addition to bandit rifles. Advancing to the foot of the hill the Bandit Forces fell back at about 3:00 p.m., leaving in the vicinity several groups of their men. As they fell back to their positions, they ravaged what could be found on the train. At or about 6:30 p.m. they again moved forward in skirmish formation and proceeded to the base of the hill. This advance was also broken up and stopped by Marine fire. The Bandit Forces kept firing during the entire time until about 8:30 p.m. They were evidently well supplied with ammunition as one or more machine guns were firing practically all of the time in addition to rifle fire and bombs. During the night there was a great deal of movement of bandit troops and what sounded like bull carts and a mule train. The Marines maintained position occupied until day-break when reinforcements from the 57th Company, under Command of Captain William K. MacNulty, U.S.Marine Corps, arrived on the scene at day-break. The attack on Bandit Forces was then taken up. Four of the twenty muleros with the column were wounded by rifle fire, two of them leaving the vicinity for ESTELI at dusk, one going to CONDEGA, the other being wounded in the groin,remained with the Marines. 6. On the morning of 28 February, 1928, after the attack upon the enemy emplacements, the three dead Marines were collec- [ p. 3 ] ted and interred near the village of BROMADEROS under the supervision of Captain MacNulty. Such equipment and effects as were found were returned to CONDEGA. The bandits killed and wounded in the skirmish were taken to their rear and it is practically impossible to ascertain the number or to form an estimate, although there were many evidences of bandits having been wounded and evacuated. 7. The two Marines that died on 28 February,1928,of wounds received in action on 27 February, 1928, were interred at DARIJLI. Existing instructions pertaining to deceased Marines were complied with to the best extent practicable. 8. Two or more of the bandit forces could speak irregular English, and made a specialty of harrassing the Marines with slurs and insults during any lull in firing. All the bandit troops that came in sight of the undersigned were outfitted with shoes. 9. At about 7:30 p.m., their fire was lulled and the man with a tenor voice complimented the bandits for their work. This was repeated in loud tones all along the line, the message as heard seemed to be, "Complimentado todos soldato por travio bueno." Upon the message being repeated, three tremendous cheers were given, interspersed each time with the detonation of from six to ten bombs. The cheer was "Vive la Sandino, vive las Nicaraguans." 10. Immediately following this cheer, three more were given for some general, the name I could not ascertain, but it sounded as though it had three syllables. 11. Shortly after 8:30 p.m., some of the bandit troops started to leave. This was the signal for more cheers. Some that were understood were "Bueno Concordia, Adios Condega, Adios Jinotega, apparently detachments from those vicinities. 12. Approximately one-third of horses and mules in the column were killed, wounded, or captured by the bandit forces. 13. The Marine dead were whacked over the head with bolos, the bandit skirmishers, splitting their skulls wide open. Several other exceptional and distinguished acts of bravery by members of the train convoy will be forwarded when all the details are available. 15. It is further recommended that all the men in the train convoy be commended for their loyal and brave conduct under severe fire and adverse conditions, it being the first time practically all of them had been subjected to heavy fire, conducted themselves as well trained soldiers performing their task in a very commendable manner. 57th Co., 2nd Bn., 11th Regt. Gy. Sgt. LARRICK, Herbert F.
/ s / EDWARD F. O'DAY. 1st Endorsement 2 March 1928. Headquarters, 2nd Battalion, 11th Regiment, Condega, Nicaragua. To: Area Commander, Northern Area, Ocotal, Nicaragua. 2. It is recommended that those men recommended in paragraph 14, for exceptional bravery by the detachment commander be cited in orders and that they be recommended for award of the Navy Cross. Necessary statements will be forwarded as soon as obtainable. Further recommendations are contemplated as soon as necessary statements can be obtained. 3. It is further recommended that the entire detachment be commended by letter for the soldierly conduct under fire. Verbal commendation has already been made by the Battalion Commander. To: Area Commander, Area of the North. Via: Commanding Officer, M.D. Yali. Subject: Relief patrol to Daryli [Darailí], report of. 1. At 2310, 27 February, upon orders from the Commanding Officer M.D. Yali, I cleared Yali with patrol consisting of twenty four enlisted marines, one enlisted navy and two native guides for the scene of the ambush of Lieut. O'Day's train near the ranch Daryli [Darailí] about 17 miles S.W. [actually N.W.] Yali, to render any assistance which might be needed there. At 0315 28 February on account of darkness and lack of familiarity with the terrain I halted the patrol. At 0520 I proceeded, and at 0805 upon my arrival reported to Lieut. O'Day at the aid station, offering the services of my patrol. Having accomplished its mission, the patrol rested, had breakfast, and at 0955 cleared for Yali (with the exception of one private from Lieut. O'Day's train and guides) . . . I have the honor of informing you that the weapons defending the sovereignty of Nicaragua continue to cover themselves with undying glory. Yesterday, the 27th of the current month, there was a bloody battle between our forces and the punitive army and the patricides in a place called El Bramadero, in the department of Estelí. After our evacuation of the fortress of El Chipote and after we had traversed the greater parts of the departments of Jinotega and Matagalpa, we decided to set up camp in the new fortress, El Chipotón, a place absolutely unknown to the punitive forces, and from here with very great success I began to carry out the plans that we had drawn up. On the 26th I ordered out the infantry column under the command of General Simón Montoya, aided by the cavalry units of General Luis Espinoza Z. and Colonel Carlos Quezada, as well as the batteries of Lewis machine guns commanded by Lieutenant Colonels José Rosas Tejada and José Lagos. This entire force was expected to overtake a regiment of eight hundred pirates who had left the village of Yalí in the direction of Condega. The moment was not long in coming. On the 27th, at two in the afternoon, as our army reached the juncture of the highways that lead from Telpaneca to Estelí, they were informed by Sergeants Major Leopoldo Telléz and Lorenzo Blandón, leaders of the advance guard, that the previously mentioned regiment was located less than a kilometer away on the same road. Our army immediately took up positions, and we had hardly gotten into place when the great pirate procession began to enter the ambush, moving slowly, unwinding like some wretched snake. When the pirates' advance guard reached our infantry's extreme forward position, the latter began to fire their weapons and, simultaneously, our two cavalry units attacked the enemy's flanks, both rear and forward; in this way the pirates were herded into a circle of riflemen and machine gunners, being almost completely wiped out. We are certain that their losses have not been less than seven hundred. We think this is the first time the Yankees have suffered a massacre of this kind in Central America. The battle lasted five and a half hours. We took from them four hundred Lewis rifles, sixteen machine guns, one hundred and eighty mules loaded with provisions and ammunition, eleven cameras, four pairs of binoculars, two cases of surgical instruments, sixty 45-caliber pistols, and a large quantity of kitchen utensils. All this was collected and taken to our main encampment. Divine Providence protects us. With our war arsenal enriched in this way, we can be certain that at this time we are stronger in war equipment than that ridiculous Adolfo Díaz himself. This month there have also been clashes of little importance, the biggest being the one that took place on the outskirts of San Juan de Segovia, where twenty-seven casualties were inflicted upon the conquerors and some rifles were taken from them. Soon we will give you additional news about our new operations. Please receive, in my name and that of my Army, a fraternal embrace. Robert E. Conrad, ed. & trans., Sandino: Testimony of a Nicaraguan Patriot, 1921-1934 (Princeton University Press, 1990), pp. 185-86.
. . . Fue el 27 de febrero. Ya nosotros conocíamos la táctica yanqui, a quienes dimos por su juego. Emplazamos todas nuestras ametralladoras en lugares estratégicos y nos pusimos a esperar. La brigada completa se colocó en el sitio deseado. Llegó el momento y . . . nuestras máquinas de guerra trepidaron hasta fundirse al calor. Los pobrecitos yanquis caían como chapulines. Fue la matanza más grande que he visto en mi vida. Desesperados, disparaban al azar, como locos; se subían a los árboles y luego caían perforados por las balas de las ametralladoras; se lanzaban al ataque de los lugares donde partían los fuegos, y no lograban llegar. Iban a pecho descubierto y ofrecían un blanco admirable a nuestras balas. Sus armas, las armas que bendijo el obispo de Granada, no les sirvieron para nada. Huyeron en dispersión. El triunfo de nosotros fue completo. El campo, un cañaveral inmenso, resecado por los vientos, cobijaba centares de muertos y heridos. Por los cuatro costados se puso fuego a las hojas secas del cañaveral. ¡Era preciso acabar con las alimañas! Las llamas se alzaron pronto avivados por el aire. El olor a carne quemada se esparció en el espacio. 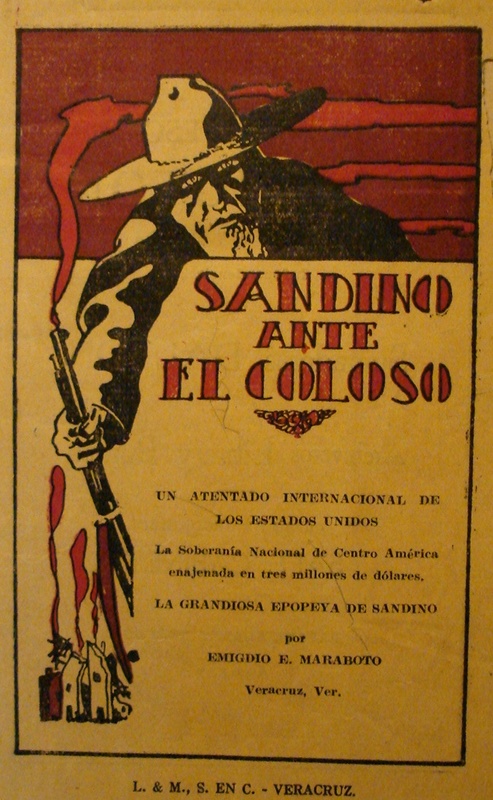 Pero Sandino fue generoso. Era crueldad inaudita quemar a los heridos imposibilitados de moverse. Cierto que eran los violadores de las mujeres nicaragüenses, los invasores, los ladrones de objetos sagrados en los templos, pero eran seres humanos. "A pesar de todo — dijo el guerrillero — son mis hermanos." Y el héroe agigantó su talla, mandando a apagar los fuegos del cañaveral y a recoger los heridos. Antes de retirarse de El Bramadero, Sandino recogió un botín de guerra magnífico: ametralladoras Lewis y Colt, rifles automáticos, gran número de pistolas Thompson y cartuchos en enorme candidad. Además, recogió el incensario de oro robado en la iglesia de Yalí, que fue entregado a los vecinos más caracterizados de El Bramadero, para ser devuelto a su lugar de origen. . . . Original cover of Maraboto's book, from the US National Archives, RG127/38/28. • A major combat — successful ambush & major victory for the EDSN, big defeat for Marines. • 3 Marines killed that day, their corpses mutilated; 2 died the next day; 8 wounded. For USMC one of the deadliest days of the war. Unknown number of EDSN casualties. • Estimated 1/3 of 99 mules killed, wounded, or captured by EDSN. • EDSN had ample weaponry & ammunition (a relative rarity); all wore shoes; material resources evidently ample. • EDSN contingents / columns from various locales converging for an ambush; implicit here: very effective EDSN intelligence and communications networks. • EDSN morale extremely high; description of "tremendous cheers" accompanied by many dynamite bombs. Some wonderful descriptions of EDSN actions. • O'Day calls rebels "Bandit Forces" — persistent capitalization connotes a well organized and formidable enemy (also somewhat ironic, oxymoronic). • Both sides use the occasion to commemorate acts of heroism, bravery, sacrifice. • Sandino's version: inflates number of Marines to 800 (more than 20 times the actual number), 700 casualties (87 times the actual number). Vast inflation of Marine casualties, amount of war materiel seized, scale of EDSN victory. 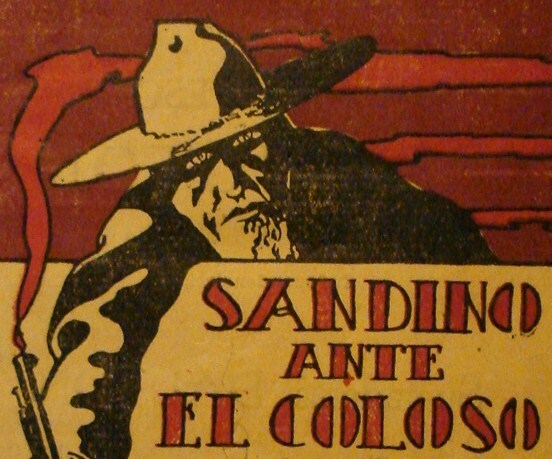 • Maraboto's version: Marines depicted as violators of women, churches, thieves of sacred objects; Sandino portrayed as magnanimous, humane, the embodiment of justice. • EDSN General (Colonel?) Luis Espinoza later died of wounds inflicted in the fight; a nephew of Moisés González, owner of the ranch Darailí; a pivotal event for González, who soon after switched sides, allied with the Marines-GN, and reluctantly permitted a garrison to be established at his ranch. • Should be read in tandem with the following report by Captain W. K. McNulty.